Posted on Wednesday, December 5th, 2012 at 11:32 am by Pieter van der Westhuizen. Years ago I found this article by Helmut Obertanner on CodeProject. 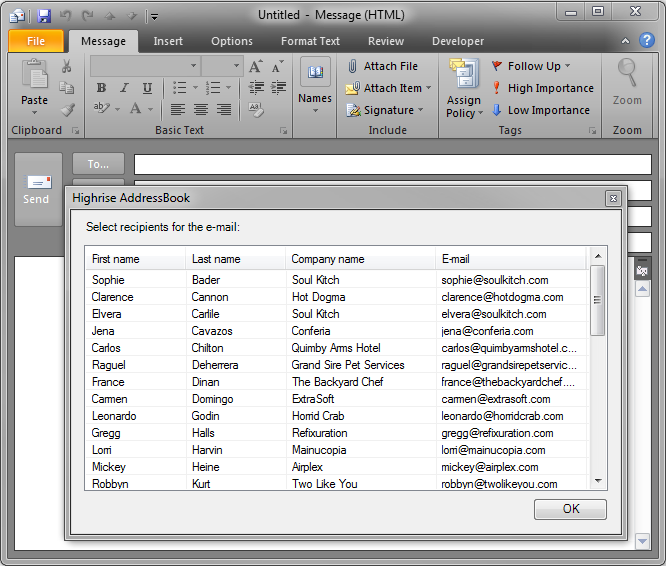 In this article Helmut explains how you can replace the built-in Outlook Address book dialog with your own form. I was amazed and intrigued! This approach is a great way to provide your users with a custom address form that is able to retrieve contact address information from literally any source e.g. CRM or customer database. 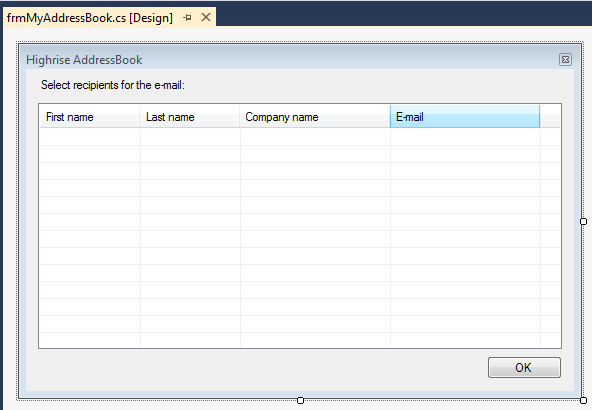 So, in today’s article I’ll show you how you can use Helmut’s code in your own Add-in Express projects and how to intercept and customize not just the built-in Outlook Address book dialog but also any other Outlook dialog. 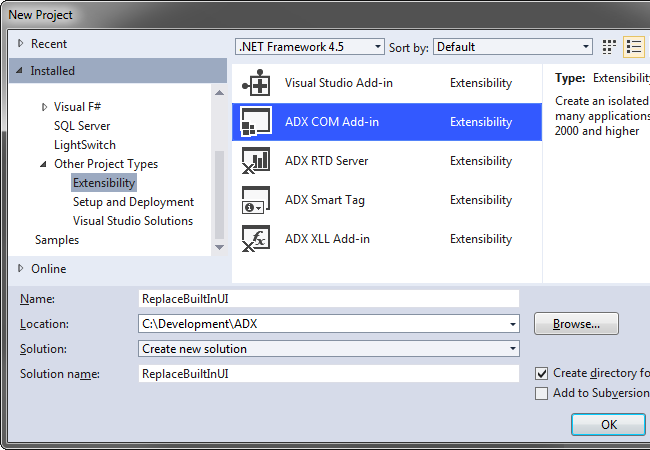 Start by creating a new ADX COM Add-in project in Visual Studio 2012 with Add-in Express for Office and .net. 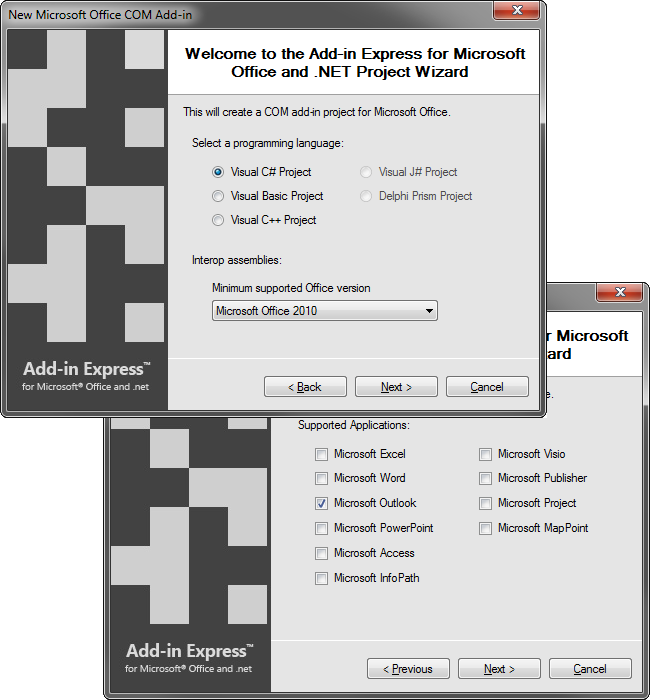 Select your programming language (it’s C# for this project), minimum supported version of Office (I’m selecting Office 2010 for my plug-in to work in Outlook 2010 and 2013) and Microsoft Outlook as the supported application and finish the wizard. Helmut mentions that a common problem with programming for Microsoft Outlook is that the user can have multiple Explorer and Inspector windows open during the Outlook session’s lifetime. This becomes a challenge when you need to know which Explorer and/or Inspector was created or closed. A good approach to address this problem is to create wrapper classes that can handle all the tricky bits for you. Both the Explorer and Inspector wrapper classes in the example implement an abstract class called WrapperClass. This class contains an ID property that will contain the unique ID of the Explorer or Inspector object as well as an event delegate to inform the application of closed objects. Since we’re not really interested in tracking any Explorers in this example, we’ll omit the ExplorerWrapper class from our sample Outlook project. We will, however, need the InspectorWrapper class. The code then loops through the Outlook window’s child controls to determine which child window is being displayed. It then sets a Boolean variable in order to display your own Windows form instead of the built-in Outlook form. 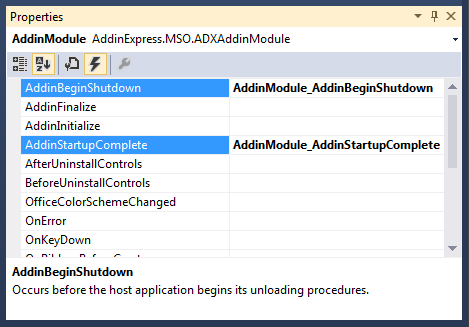 With all the helper classes added, switch back to the AddinModule’s designer and add events handlers for its AddinBeginShutdown and AddinStartupComplete events by double-clicking next to the event names in the Visual Studio property grid. The code in the event handler creates new instances for the _WrappedObjects and _Inspectors objects and then wraps any open Inspector using the WrapInspector method. Lastly, a new event handler is declared for the _Inspectors object’s NewInspector event. The code above will use the Highrise API and retrieve the contacts from the web and load it into the list view on the custom Outlook form. The person class is a wrapper for the Highrise person object and is included in the sample project. Build, register and run your project and if everything goes according to plan, you should see your custom address lookup dialog when clicking the To button on the e-mail inspector window in Outlook.